Enjoy Majestic Sunsets from this sound front haven nestled in the quiet community of Colington Harbour. Spend the day splashing in the private pool or just enjoying the sun on the decks with a good book. 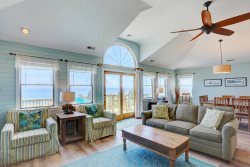 If peace and quiet is what you're looking for, you'll find it at this coastal paradise that’s just minutes away from famed Kill Devil Hills beaches, shopping and dining. While sitting on the decks and taking in the nightly sunsets will be a favorite activity at this gracious vacation home, guests will discover that there’s plenty to love about Majestic Sunsets, inside and out. The exterior boasts a private pool as well as a large screened porch with hot tub and sound vistas, while inside, guests can unwind with a game of billiards in the ground level game room, or with a well-deserved nap in one of three bedrooms on the second level which are close to a large covered deck. At the end of the day, guests can recap the day’s adventures in the grand top level which features a living area with gas fireplace, gracious dining area, a kitchen with top notch appliances, and a nearby king master suite with deck access and sound views. From the array of amenities to the stunning sound vistas throughout, the coastal life is a dream at Majestic Sunsets. From the quiet locale in the picturesque Colington Harbour community, to the miles of views that serve as a pristine backdrop, Majestic Sunsets is a prime representation of Outer Banks living at its best. Discover a world of vacation fun and adventure, and make your escape to this grand waterfront retreat today. We used Seaside Vacations this year to rent our beach house for our annual family vacation. Boy, we were not disappointed! We arrived at Majestic Sunsets the first evening, and walked through the house exclaiming how clean and big it was. After "claiming" our personal bedrooms, we got together in the kitchen/living area, with everyone chattering about what a great house we found! Throughout the week, we used the private pool almost daily. We loved it! We used the private dock for fishing and crabbing, actually catching 16 crabs for one dinner. The hot tub also was a busy place in the evenings. We were quite impressed with the cleaning service. Not only was the hot tub and pool clean and ready when we arrived, but it was cleaned again half way through our stay. We had an awesome vacation! Thank you, Seaside Vacations! We have booked Majestic Sunsets for three years in a row. We love the serenity of the sound and dock right outside the door. The pool and hot tub are fantastic! The dock wasn't complete during our stay but there was still a lot of fishing going on!! Thank you homeowners for sharing your beautiful home with us again for another year.